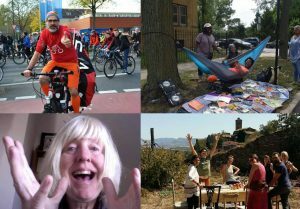 Transition Initiatives are places where there is a community-led process to help a town/village/city/neighbourhood become stronger, happier and more resilient. There are currently in excess of a thousand such initiatives across the world – from towns in Australia to neighbourhoods in Portugal, from cities in Brazil to rural communities in Slovenia, from urban locations in Britain to islands off the coast of Canada. Many of these initiatives are registered on the Transition Network website.